Forgive the nostalgia, but know what I miss about the nineties? You could throw people in the pool without worrying about damaging a $900 phone. None of that these days. 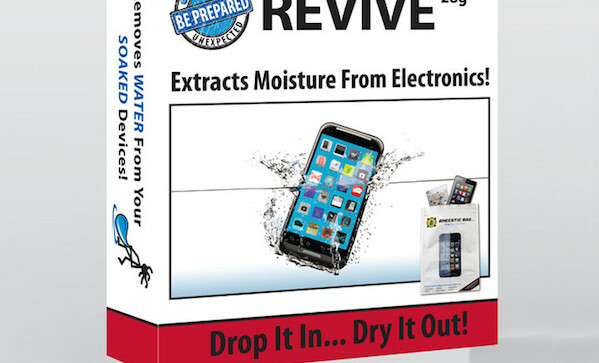 We’re all too scared of wet electronics, which you’ve probably experienced first hand. Maybe it wasn’t a pool for you—maybe it was a sudden downpour, or snow melting on a duffle bag. Whatever it was, afterwards you probably dropped your device in a bowl of rice and waited. Here’s a better method: a Bheestie Revive bag ($18). Basically, it’s a bag full of specially designed molecular beads that can absorb water beyond the point of humidity equilibrium. All you need to do is switch off your wet device, remove the battery if possible, drop it in the bag, and wait a day. In order to test whether that’d work, I sacrificed one of my old phones kicking around my drawer of replaced technology—a Motorola Razr—by giving it a thorough dunking. A little more than a day later, it was good as new. Still antiquated, but there you go. The Bheestie bag I tested was from their 28g range, which is good for stuff like phones, small cameras, watches, hearing aids, mp3 players, ear buds . . . you get the idea. Anything that’s small, electronic, and doesn’t like being wet. They also make a 56g range, though, which can fit laptops, e-readers, tablets, game controllers, camera lenses, fish finders, headsets, and more. And in addition to their Revive bags, which are gear towards first aid, they make a bag called Protech, for keeping devices dry on a daily basis, and Sport, for people who are going out into the wild with sensitive equipment they don’t want to get wet. Here’s the thing, though: you want to have something like this before you need it. I’m keeping a first aid bag in my briefcase for that reason—and if I don’t use it, hey, it’s still better to have piece of mind, right?